Panasonic is not necessarily the first brand that comes to mind for many when you think of dental health or water flossers, but the Japanese firm do make them. The EW-DJ10-A cordless oral irrigator is the focus of this review. For those serious about dental health, in particular flossing, you will likely have heard of the benefits of water flossing. Well, the EW-DJ10-A brings these in a portable, wire free solution that can be easily stored in a bag, ideal for those always on the go, but would rather not have to rely on string floss. Keep reading to find out how we rated it, and be sure to check out our posts on the top rated water flossers, and in particular our recommendations for best cordless water flosser. What is the EW-DJ10-A Cordless Oral Irrigator? 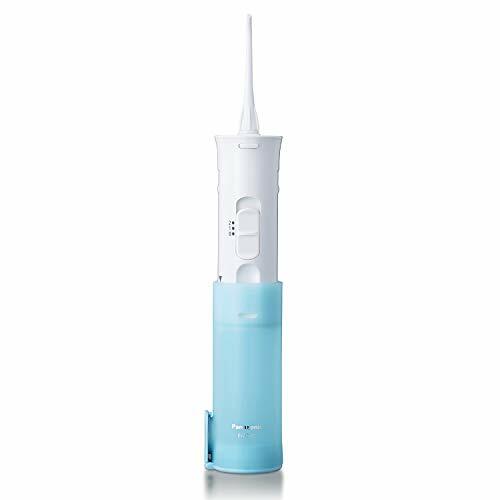 It is a water flosser, oral irrigator is just another name for this. A handheld device, it is made up primarily of a pump and a reservoir. In the reservoir you place water and when powered on, the pump draws the water out and feeds it through a tube at the top of the flosser into your mouth. A powerful jet of water, forces plaque and bacteria off and away from the teeth and gums. The stream of water is often softer, less abrasive and a generally more enjoyable method of flossing for many. Assuming batteries have been installed. Extend the unit from its collapsed position, pulling the Blue water tank and White control unit away from each other. The top of the water tank will align with an arrow on the side of the White unit when fully extended. If there is resistance when doing this, open up the door to the water reservoir. Remove the nozzle from the storage point on the back of the unit. Place it into the hole on the top of the unit and you will hear a click when in place. Open the reservoir door at the top of the unit and fill the compartment with luke water until it is a little less than full. Close the door to the reservoir. Holding the flosser upright, place the tip of the flosser into your mouth. Power it on, by sliding the switch on the front to 1 of the 2 power settings. Aim water at the gumline at a 90 degree angle. Follow the gumline and pause briefly between teeth. It is a competitor to the popular water flossers from market leader Waterpik. Manufactured by well known technology brand Panasonic, this cordless flosser is powered by 2 x AA batteries and has a unique design that makes it compact for travel, something many others fail to achieve. The 2 x AA batteries required to power the unit are not supplied. Here are a list of the pro’s and cons having used the EW-DJ10-A. Compact – Neat design makes this ideal for travellers. AA batteries – User removable and replaceable AA batteries power the unit. Waterproof – The unit is waterproof, it can be rinsed and used in the shower. Small tank – Holds enough water for up to 40 seconds, which is not really long enough in many people’s opinions. Value – Batteries not included, only 1 nozzle in the box. By their very nature a water flosser requires water to function. Countertop water flossers have large tanks that accomodate 14-23oz, and allow for 60-90 seconds of usage time on average. The problem with these is that you are tied to a power socket. Thus portable flossers become appealing. Giving you more flexibility to move and to take them in a bag when travelling they overcome such a restriction. But cordless options, by their very nature cannot offer such large water tank, constrained to what is physically possible for most to hold and use in the hand. This means that usage time is reduced to 30-45 seconds on average. It also means that trying to strike a balance between size and function is difficult. For regular travellers who want the benefits of a water flosser, cordless is the only way to go. For infrequent travellers, a countertop flosser might be better suited. The EW-DJ10-A is aimed at those frequent travellers, or those who want to have a flosser to hand in situations others may not. Whilst American brand Waterpik may be considered the market leader, Japanese firm Panasonic have designed this irrigator to do something I have not seen from any other. The innovative design allows the unit to extend and collapse on itself. This means it is smaller and more compact when not in use, but can be extended when required. The hands on images perhaps demonstrate the design best, but a Blue coloured reservoir or water tank slides over the main unit and control centre that is White in colour. When you want to use it, you pull the 2 pieces away from each other, they slide apart until the Blue plastic tank aligns with an arrow on the side of the main unit. Fully extended, the reservoir can now be filled with 5.5oz (160ml) of water for flossing. To fill it, at the base of the tank is a hinged lid to the compartment, with an o-ring seal that keeps the liquid inside when closed. Opening the compartment lid is advised to make extending the unit easier too. On the back of the unit is a recess into which the detachable nozzle resides for travel. Pull it out and pop it into the hole on the top of the unit. When pushed into place, it will click in and you won’t be able to remove it, unless you press the eject button to unclip it. That eject/release button is found on the front of the White control unit. Lower down on that unit is the slider power button. 3 positions, 0, 1 and 2, you can change the unit from off to low to high pressure. Only switch the unit on when the attached nozzle has been placed in the mouth, otherwise water will spray everywhere. The whole unit has an ovalish shape to it and does feel a bit bulky in hand. Once you have finished with it, the nozzle fits back into the storage section on the back and the White upper part of the flosser can be pushed back inside the now empty water tank. This is now compact again for travel, fitting neatly within a backpack, suitcase or other travel bag. Clever and practical this is. Several Waterpik units are designed to be travel friendly, but none collapse in this way. The closest they get to this is the removable nozzle/jet tip. They don’t then offer a place to store this tip either. A small travel pouch is then provided normally so that the flossing unit and nozzles can be held together. It would be nice if the Panasonic came with a pouch to protect it a bit more absorb any excess moisture, but its not critical. Currently ‘the best’ option for those always on the go (travellers and on the road business people come to mind) no other brand to my knowledge thinks about the limited bag space you may have so well. When it comes to everyday use, it is pretty good too. It has now won the American Dental Association (ADA) seal of acceptance like Waterpik have, but you don’t need to be a dentist to know when running it is doing something you can feel it on the teeth and gums. The mouth feels cleaner after use. Powered by 2 x AA batteries, these fit into the top of the unit. You need to remove a screw cap that requires a flat head screwdriver or coin to open it. A bit fiddly, this could be better designed. Given that you probably need to replace the batteries every couple of months, it’s hardly the biggest issue. Fill the tank with lukewarm water to commence cleaning. The tank holds 5.5oz (160ml) which means up to 40 seconds of usage time. For many, unless you have nailed your technique this is not enough capacity, so you may want to refill it during your flossing session until you are happy with the clean. If you have not used a water flosser before, it can take a bit of practice, its not the most natural thing to do. You need to get the technique right, not only to clean the teeth and gums properly but to avoid making a real mess. Although only a few oz, you need to be leant over a sink to allow the excess water to run from the mouth. There is no better way to see how best to floss with a water flosser than to watch a demonstration. Sadly, Panasonic do not have a demo. However, the video below from Waterpik gives you a good demo, even if the products are different. There are 2 pressure settings, available, switch between 1 and 2 for a low and high setting. 1 is the slower, softer clean whilst 2 uses the maximum pressure available for an invigorating clean. Up to 1,400 pulses per minute are produced by the pump per minute to remove plaque and bacteria from the teeth. When directed at 90 degrees at the gumline, the pressure will dislodge food and bacteria, including that hidden under the gumline, that you can’t see or always reach. Just one nozzle comes provided in the box, this when fitted can be rotated a full 360 degrees during use to position the jet of water precisely. Ridges around the base of the nozzle make it easy for the finger to touch and adjust. Each nozzle has a working life of approximately 6 months. A pack of 2 often costs $10, so $5 per tip. There is no choice of nozzles, no different styles or designs that are suited to different users. Those with periodontal pockets, braces or implants might find the more diverse range of jet tips from Waterpik to be more suitable. The whole unit is waterproof so it can be rinsed under a tap and used in the shower if you desire. Overall the unit performs well and there is not much to dislike. Panasonic are not as well known in this space and Waterpik certainly have a more complete offering as well as having achieved the ADA seal of approval. However, this is the best option if space is at a premium. One of the appeals of this Panasonic water flosser is the fact that it is powered by 2 x AA batteries. Sadly, none come provided in the box with the unit, but they are fairly cheap and easy to source. On the top of the unit is where you access the battery compartment. A screw in cap seals the compartment shut and stops water getting in. You will need a flat head screwdriver or a coin to insert into the recess to unscrew the cap. Once released, the 2 batteries can be inserted and the cap screwed back in place. It would be nicer if you didn’t need to make use of a coin or screwdriver to undo this. A completely different design, but Waterpiks Freedom Cordless unit allows for the battery compartment to be easily unlocked and accessed, no tools required, just your fingers. Once in, a new set of batteries will give roughly 50 minute of usage time. That is equivalent to 75 days of use, based on 1 user flossing once a day and using a full tank each time. Different brands of battery can have an impact in the performance as can how often you use the flosser. Use it twice a day or fill the tank up a couple of times each use, this will increase the frequency of battery replacement. Some may prefer a built in battery, but in my experience, the AA option tends to provide longer battery life. It is possible you could use rechargeable AA batteries in the unit if you desired. There is no warning when the batteries are low aside from the power of the unit decreasing or stopping. Therefore you may want to carry a spare set with you. But, even in more remote locations AA batteries are generally easy to buy. No option exists to connect this to mains power. Uses user removable AA batteries. Only know batteries are low when power reduces or unit stops. $34.99 is the typical retail price of the EW-DJ10-A cordless flosser. A fairly low retail price means that it is not all that common to see a discount or special offer running on this product – we’ve included a live price comparison of retailers stocking it below. You might be able to save a few dollars if you shop around, but it might be more hassle than the likely savings you will achieve. For this price, you will get the unit itself and 1 nozzle. It will need AA batteries too. The cost of these do vary, but subject to pack size a fair price is $1 for 2 x AA’s if bought in bulk. You do need to consider in the price of replacement nozzles/tips. A pack of 2 costs about $10 and last about 6 months each, so at $5 each they are fairly good value. Whilst the ED-DJ10-A comes with a 2 year warranty, most products last longer than this. To give a rough cost guide, here at Electric Teeth, we price products over a 3 year period. The Panasonic will work out at $75 ($35 + $25 (5 nozzles at $5 each) + $15 (30 x AA batteries) over 3 years or $0.07 per day. Compared to regular tape floss at is just 1-2 cents per day this my seem quite expensive, but you are paying for the convenience. At the time of review, the WF-03 Cordless Freedom version from Waterpik is similarly priced. Bulkier it might not be the best alternative, but it is American Dental Association approved. This is the first Panasonic water flosser I have tested. A few weeks of hands on testing has not given any cause for concern in regards to the build quality and reliability. No specialist tests are performed here at Electric Teeth, we use the products just like you would. A few reports from other product owners online have suggested that the unit can get moldy in places and the reliability is a cause for concern. Unable to make comment on particular cases, the very nature of the product means that some will likely fail and for this there is a 2 year warranty that covers mechanical faults and labor. To avoid any bacteria of mold buildup, clean the device regularly and thoroughly as described in the provided instructions and keep the unit in a well ventilated area. The collapsible design has to be the Panasonic’s best feature, making it particularly appealing to those who travel or like to have a flosser with them most of the time. It does what others of this type fail to do, keep the size small. 2 pressure settings and user removable AA batteries are a bonus too. Perhaps a little expensive considering the competition and what you get, but not a huge difference in price, there is a sense, of better value from Waterpik in my opinion. Whilst Panasonic are a household name, their lack of other dental products could be a cause of concern for some. Ultimately there is little I can fault with the Panasonic, but unless a compact design is really what you need, I would give serious consideration to American Dental Association approved Waterpik for the all round best performance, value and peace of mind. Based on 1 use per day you will get about 50 minutes of usage time, which is roughly 75 days of use between battery replacement. No, it is powered by AA batteries. Can I use mouthwash in the Panasonic? Approx 5.5oz/160 ml which will last for 40 seconds. Can I use the Waterpik in the shower? Yes, the unit is waterproof and can be used in the shower. No, a travel case is not provided. The unit collapses on itself and has a storage space for the nozzle in the back of the unit. Do you own or have you used the Panasonic ED-DJ10-A cordless water flosser?